The Martin Archery Savannah Stealth Longbow is one of the bestselling longbows in the history of this company. The Savannah Company has inscribed a long legacy of serving its customers with high-quality products. With its reflex design and energy conservation model, this product has become a favorite of long bow appreciators everywhere. This model is designed for superior capabilities, eliminating the shock associated with other designs. The beauty of this bow, combined with its high caliber material construction, makes it a worthy model for any bow enthusiast’s collection. The specifications for this bow are as follows. It permits between a 40 lb and a 65 pound draw weight, increasing its uses and versatility. Its brace height ranges between 6.5 inches and 7.5 inches, permitting a breath of lateral movements. This longbow also consists of an impressive 1 lb 7 oz mass height as well. Not only does it come with zebra laminates, but its AMO string length is 64 inches total. There are many aesthetic, structural and performance-oriented pros of this model. First, because this longbow is reinforced with a reflex design, it conserves energy with each shot, while decreasing the shock exerted on the hand. Thus, it is designed for ease of use and comfort as well. Another advantage of this model is it is characterized by traditional rest, as well as a bow sock and a flemish bowstring. It comes with bow packages, as well. Aesthetically, this bow is pleasing to the eye. It is lavished with a vast spectrum of dark wooden striations and accents. Its Bubinga riser is decorated primly with zebra print wood and dark silver, as well. With laminated limbs and reinforced limb tips, it is engineered for durability and strength. This bow is both stealthy and sleek, and it is designed for subtly, which helps it blend into virtually any environment. There is, of course, a con associated with buying this longbow model. The description fails to clearly indicate whether this is for left handers or right handers. However, it is in fact designed for right handed individuals. 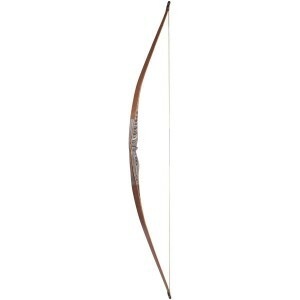 Customers have raved endlessly about this longbow model. They have praised its functional abilities and its aesthetic qualities alike. Some have described this bow as smooth, beautiful and comfortable in their grip. They praise its seamless shooting abilities and they appear to be very satisfied with it. Many have even described this is a high-quality bow and a personal favorite as well. Customers have also raved about the cloth sock, which helps protect the bow from external damage. With the cloth sock, you can safeguard your crossbow from scratches and external damage as well. Customers were also pleased with the bow stringer, which is major essential for crossbow enthusiasts. Finally, the self-adhesive leather patch was yet another great addition that customers mentioned. Most if not all customers took note of the beauty this crossbow has to offer. From the flawless finish, to the satin-like smooth wood, they could not resist the fiberglass clad wood, along with the camo mystique that this bow dawned ever so majestically. When choosing a longbow model, there are four considerations you should make: the design, the functional capacity, mechanical capabilities, and the customers who have reviewed the product. What good are state of the art design and mechanics unless they adapt to the human experience? Overall, the reviews on this product have been overwhelmingly positive, and they seem to align with the promises and specifications that the company describes. Given the consistency, in this long bow’s description quality, I would highly recommend it. Not only does it permit a firm grip and comfort while using it, it functions beautifully as well. It may be one of the best longbow products out there.